The Adasaurus name means Ada's Lizard. It was a smaller Carnivore from the late Cretaceous Period. According to Mongolia mythology "Ada" means evil spirit, and in Greek sauros means lizard, which is a very common ending to a dinosaur's name. There were a total of two different fossils discovered in the Nenegt Formation, in Bayankhonger, Mongolia (Central Asia). Formation is famous for the discoveries of many dinosaurs such as the Tarbosaurus, Anserimimus, and the Saurolophus. It is also known for many other types of findings of fossils with turtles, reptiles, fish, and birds. The area is thought to be a Late Cretaceous dated region, but it’s not 100% proven yet. The one species Adasaurus Mongoliensis was obviously named after the country. Both fossil skeletons were found and described by Barsbold in 1983. The first discovery consisted of a skull, all three pelvises, along with many misalainious body bone parts. The second discovery was the lower half of its body including the hindlimbs and feet etc. Adasaurus is part of the Dromaeosaurinae family making it closely related to the Deinonychus, Velociraptor, Microraptor, and Buitreaptor. So they have much in common. They are smaller, have sharp claws, a long tail, feathers possibly, etc. 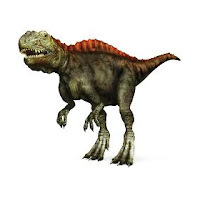 Except the pictured genus is Acrocanthosaurus.